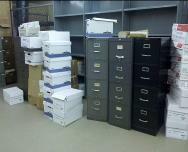 Does your current records storage system look like this? E-Business Alternatives, LLC of Beaufort, South Carolina, is a local, full-service minority woman owned business specializing in all aspects of document management. Services include digital scanning, indexing, disaster planning, electronic storage, records distribution, archiving and certified document destruction. Our highly qualified staff has over 30 years of records management experience covering a range of disciplines: finance, medical and legal administration, human resources, banking, government and more. We combine the use of today’s most secure imaging software program with our business backgrounds to assure that all of our clients’ requirements are met. We ensure quality in everything we do and strive to insure that our document imaging solutions adhere to industry standards and exceed our clients’ expectations. Our goal is to help organize, protect and make readily available the information on which your company’s success depends.